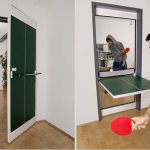 The crazy invention we found is the Ping- Pong door and it was designed by Tobias Franzel. It looks like a normal door, but its surface designs a Ping- Pong ball table. The door has a swing-out panel that turns the doorway into a mini ping pong table — a multi-purpose object perfect for small spaces. The door has two axises in the middle of door,so it can be rotated 90 degree, when you want to play Ping-Pong. It is a pretty creative invention because it can save space, especially in a office building. Nowadays, people are so busy that they don not have time to do exercises. This invention can provide more chances to them to strength their body and improve their immune system and they will have more fun in home as well.To sum up, the Ping-Pong door is pretty crazy invention, which can save space, help people keep health and have fun. This sounds like an interesting and fun invention. How do you think it could be improved?